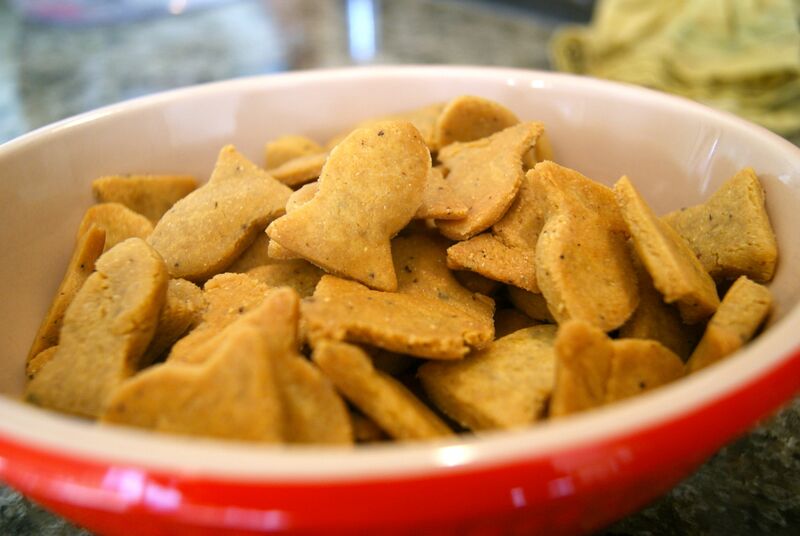 Goldfish crackers seem to be nearly every child’s favorite snack because they are salty, cheesy, crunchy, and just good. One reason the Pepperidge Farms goldfish crackers are so addictive is because they contain MSG (monosodium glutamate). Yikes! MSG is a flavor enhancer, a preservative and also an addictive neurotoxin. MSG can also be labeled on food labels as hydrolyzed protein, autolyzed yeast and/or protein concentrates. Look out, goldfish crackers contain autolyzed yeast on their ingredient list! We looked for a healthy and tasteful alternative that was both vegan and gluten free… and without MSG. We found one we could adapt to fit our dietary needs and our daughter loves them! She has never actually had store bought goldfish crackers but has see her friends eat them so she is very excited she can have some too. This recipe is simple and so fun for kids to help with too. Here is a link to a cute goldfish cookie cutter. In the bowl of a standing mixer, combine flours, nutritional yeast, pepper and salt. Cut in the butter using the whisk attachment or a fork. Stir in milk, 1 tablespoon at a time, until dough forms. Roll out the dough on a lightly floured surface or place dough between two sheets of parchment paper and roll out to a ¼ inch thickness. Cut out shapes with a small cookie cutter (1-2 inch). Roll out the dough again and cut more shapes, repeat until all the dough is used. Place on baking sheet lined with parchment paper. Bake 15-18 minutes until lightly golden brown. Note: The longer they bake the crispier the cracker. Remove from baking sheet and cool. Eat! Variations: Add your favorite spices or herbs. We like adding plenty of extra ground black pepper, yum!